Help us out and have fun too! This Sunday, join LOSF and the Teacher with the Bus get a free ride on the coolest buses in town and help promote energy conservation at the same time! 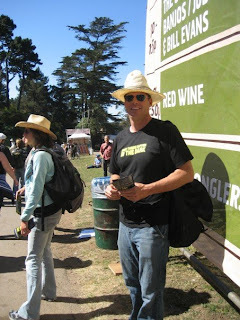 volunteer@lightsoutsf.org by the end of the day October 13th. Also, reserve between 5-9pm on October 20th in Dolores Park for a LOSF celebration with DJ Mancub, Beatropilis & a surprise unamplifed contributor while the lights are out! Visit www.lightpollution.org to download a PDF of the entire article. It’s been a while since I’ve posted something other than event notices and media mentions. Today I’d like to take a moment to direct you all toward a few green resources. NRDC has a Green Living Toolkit, where you will find a comprehensive list of well-written guides, tips, and other resources that will help you live a more sustainable lifestyle. And, even more importantly, news about pending legislation and global warming appears every day. According to an AP writeup by H. Josef Hebert, last week the EPA “examined the long-term impact of three climate change bills being considered in the Senate, each of which would cap carbon dioxide emissions from cars, industry and power plants with an goal of reducing greenhouse gas releases by 60 to 65 percent by mid-century”. For the entire article, read “EPA: Competing Bills Achieve Same Goal”. Today (actually, tomorrow…) we were featured in The Sydney Morning Herald. We were also reviewed on Yelp!. Hop on board the bus with us again this Sunday! We’ll be at it again this Sunday, October 14th. Our friend Peter, the Teacher with the Bus has graciously offered not one, but BOTH of his buses for us to use this Sunday. His buses are big, grey, and hard to miss. e-mail us and join in. Or, track us down and get your FREE energy-efficient light bulb! Thank to all those who supported us by coming to Medjool! It was great seeing you all on Medjool’s Sky Terrace last night! Many thanks to Gus for offering up his space. Thanks again to our Castro St. fair volunteers! 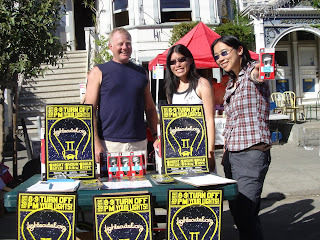 A big thank you to Richard, Eileen, and Jenna who volunteered with us at the Castro St. Fair on Sunday. What a great day! We distributed over 500 CFLs, along with lots of brochures and posters. Do you want to help us out this weekend? We will be at Oktoberfest at the Fort Mason Center on Saturday and on Sunday we will continuing our famous bus tour around the city. Drop us a line at volunteer@lightsoutsf.org and let us know if you can give us a hand! Nate had the opportunity to talk about LOSF on NPR’s “Living On Earth”, which aired this weekend. I think the segment turned out well. Check it out. Thanks go to Michael and Scott, for including us in their greenerImpact blog. Fun times on the bus, success at the Castro St. Fair, and more fun times at Medjool tonight! 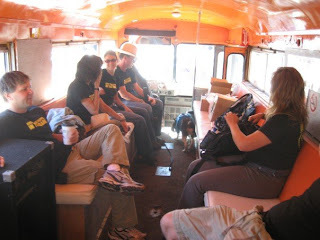 Thanks to all those who joined us yesterday on Peter’s bus to help us spread the word about LOSF! Brendan reported that tabling at Castro St. Fair was a success. Approximately 500 CFLs distributed, along with lots of brochures and posters. Lots of comments to the effect of “Yeah, I’ve heard about you guys…” Go Brendan! Also, please join us tonight at 6:30pm at Medjool from 6:30-9:30pm. Medjool is located at 2522 Mission St.–the LOSF team will be on the rooftop. We’re looking forward to seeing you all there. Yesterday the Lights Out team visited the Energy Star bus at Safeway in the Marina. PG&E was present there as well, and they announced that they have made a deal with Safeway to sell CFLs at a discount as well. PG&E also plans to give away 1 million energy efficient light bulbs. PG&E estimates over the lifetime of the 1 million bulbs - if they’re installed in California homes - will save more 400,000 megawatts of electricity and eliminate 200,000 tons of greenhouse gases. Thank you to Michael, for adding us to his greenerImpact blog.